There’s just something about the green and minimalistic packaging that really draws me into Pixi – it’s like a little breath of fresh air. 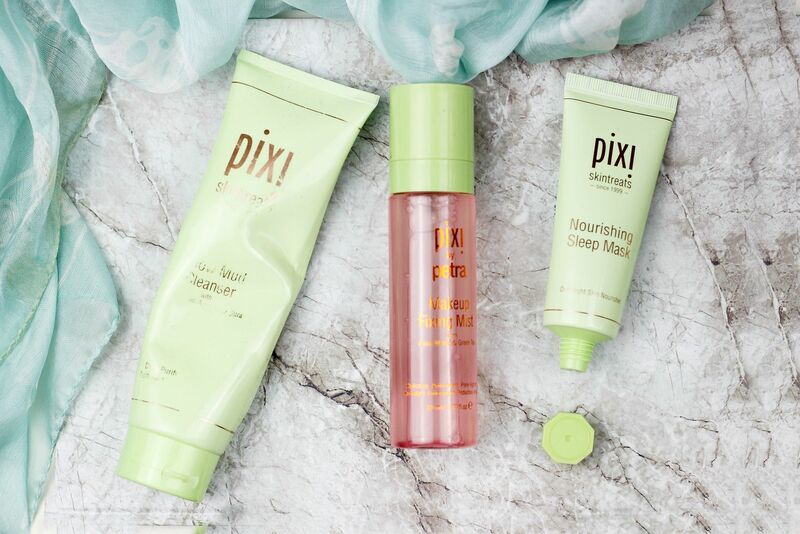 Aside from gorgeous makeup, Pixi does some really nice little pieces of skincare that I’ve been trailing and testing for the last couple of months. You may notice that I am missing the glow tonic in this edit, because I think it is overhyped… Sorry, Pixi! I just think there are better acid toners out there. I do love the Glow Mud cleanser though, which is an excellent glycolic cleanser for when you want to make your skin look brighter. This really is a hard-working cleanser that I like to reach for when my skin is a little congested (sadly happens a lot!). For an overnight hydration boost without being too sticky, I am a big fan of the Nourishing Sleep Mask. I really think this is the perfect option for adding hydration if your skin is dehydrated easily or if it can feel overloaded with something too rich. It’s packed full of hyaluronic acid, which my skin just loves. Lastly, a handbag hero – the Make Up Fixing Mist. This lives in my desk at work for when I want a mid-afternoon skin pick me up. It feels refreshing and layers well over makeup – not too wet or too sticky.